The East-West Freeway is an east-west freeway originating in downtown Milwaukee and running westerly through the city and suburbs, then into Waukesha County where it continues past Waukesha and on toward Madison. The lion's share of the East-West Freeway is part of I-94, the longest of Wisconsin's mainline Interstate highways, while the easternmost portion in downtown Milwaukee is part of I-794. Historically, the East-West Freeway is one of the, if not the, most heavily-traveled freeways in the state. From the Stadium Interchange, the East-West Freeway continues westerly past State Fair Park and the Petit National Ice Center to the Zoo Interchange and the I-41/I-894/US-41/US-45/Zoo Freeway. The freeway continues westerly, leaving Milwaukee Co and entering Waukesha Co and the City of Brookfield, running within a mile of the southern city limit the whole distance across the city. Continuing through the Goerkes Corners area, the freeway bends slightly to the north to bypass Waukesha before continuing westerly past Delafield and Oconomowoc and on toward Madison. From the earliest expressway plans in the City of Milwaukee, dating back to 1946, an expressway running westerly from downtown, usually paralleling Highland Ave or Wisconsin Ave, was included in each incarnation. In 1958, debate raged as to what form the East-West Expressway through downtown Milwaukee should take: elevated freeway or surface boulevard. In a debate eerily reminiscent of one in the 1990s, then-Mayor Frank Zeidler actively campaigned for the surface boulevard option and even vetoed the original Common Council resolution to build the elevated freeway structure proposed by the Milwaukee County Expressway Commission. The council overrode the veto and freeway was built as it exists today. Zeidler later changed his opinion and in a 1998 interview in the Milwaukee Journal-Sentinel, he noted, "'Today, it is better than it would be' if a boulevard were built in place of I-794. 'The freeway seems to me critical.'" West of downtown, a Journal-Sentinelarticle detailing the history of the Milwaukee freeway system noted that in the 1950s, "The location of the East-West (now I-94) was easily fixed between 6th St. and Hawley Road since 'the abandonment of the rapid transit right-of-way for railroad use provided a natural route with a minimum of property damage.'" 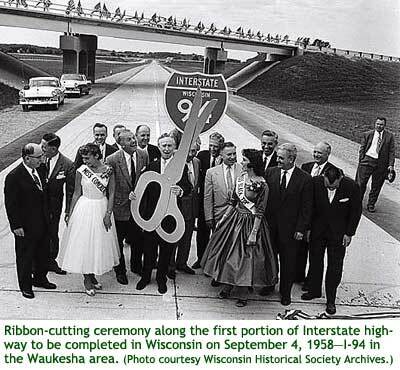 In 1956, the first segment of I-94, or any Interstate for that matter, to begin construction in Wisconsin was the East-West Freeway in Waukesha County between the present-day interchanges with US-18/STH-164/CHT-Y/CTH-JJ at Goerkes Corners (Exit 297) and CTH-SS (Exit 290) west of Waukesha. This segment of freeway was completed and opened to traffic on September 4, 1958 and was originally signed as part of US-16 and STH-30 until more of I-94 was completed. The first segment of the East-West Freeway to open to traffic in Milwaukee County was the portion from 16th St westerly through the Stadium Interchange to Hawley Rd in late 1961. The next year, a short westerly extension was completed from Hawley to 68th St.
Then in 1963, the temporary eastern end of the East-West Freeway at 16th St was removed when the freeway was extended to the east a short distance to a new interchange with 13th St, at the western end of the Marquette Interchange, which was just underway at the time. 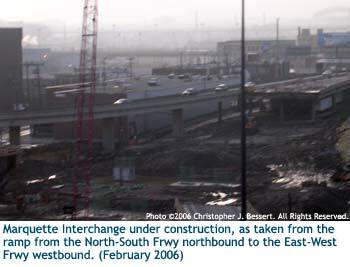 On the west, the freeway was extended from 68th St westerly through the new Zoo Interchange (jct I-894/US-45) and on through Brookfield to Goerkes Corners, where the I-94 designation was then applied to the first Interstate segment to be completed in Wisconsin bypassing Waukesha to the north and continuing westerly along the STH-30 corridor to west of Delafield, merging back down into the two-lane STH-30 route east of STH-67. The ramps to and from 6th St through the yet-unfinished Marquette Interchange in downtown Milwaukee were completed in 1966, extending the freeway a short distance farther to the east, with further extension in 1968 when the freeway and ramps to Plankinton Ave was opened to traffic. A year later the freeway was again extended to the east, this time across the Milwaukee River to the ramps for Jackson and Van Buren Sts. The East-West Freeway was not officially complete until 1977, when the much of the Lake Interchange was finished, completing the connection with the Lake Freeway and Daniel Hoan Bridge heading to the south. The rest of the Lake Interchange, the portion leading to the north, would not be complete until the mid-1980s when the stub-end ramps were removed and connections with Lincoln Memorial Dr were made. In 1995, outspoken Milwaukee Mayor John O. Norquist proposed the I-794 portion of the East-West Freeway from the Marquette Interchange easterly to, and including, the Lake Interchange be removed completely and replaced with a landscaped surface boulevard. In his book "Greater Milwaukee's Growing Pains, 1950-2000: An Insider's View," Richard W. Cutler suggests this scheme was due, in part, to the expected reconstruction of the aging Marquette Interchange within the next decade or so. To demote that stretch of freeway to a surface street with no control of access would lessen the need for a major reconstruction of the Marquette, or at least limit the amount of additional land needed for the rebuild. There was nearly universal opposition to the proposal to remove the freeway from elected officials and civic leaders outside of Milwaukee for a variety of reasons. Cutler notes: "I-794 in 1998 was carrying over 89,000 vehicles a day, double the amount handled by the six-lane Bluemound Road Boulevard in Brookfield." Indeed, once the STH-794/Lake Parkway opened through Bay View, Cudahy and South Milwaukee in 1999, traffic volumes on the East-West Freeway through downtown continued to climb, to over 111,000 in 2004. The East-West Freeway from the Marquette Interchange to the Stadium Interchange got an additional route designation in 1999: US-41. This was in response to neighborhood opposition to a project to reconstruct and widen a portion of US-41 along Layton Blvd in southern Milwaukee. The state gave the boulevard to the city and moved US-41 onto the freeway routing. Then in 2004, the much-anticipated complete reconstruction of the downtown Marquette Interchange commenced and was completed and opened to traffic on August 19, 2008. Then in 2015, the 16 years of the East-West Freeway hosting the US-41 route designation between the Marquette and Stadium Interchanges came to an end when US-41 and its new Interstate paring, I-41, were routed around the city via the Airport Freeway and Zoo Freeway. Note: The map below will be updated in the near future to show the many route designation changes from 2015. Copyright © 1997-2016 Christopher J. Bessert. All Rights Reserved. | chris.bessert@gmail.com | Last updated Monday, October 10, 2016.